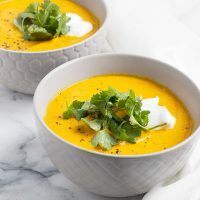 This lovely soup makes use of some great fresh, winter produce – carrots and pumpkin. If you can’t find a fresh pumpkin though, canned pumpkin puree will work just fine. The coconut adds an extra something to this soup but may not be to everyone’s taste, so it is certainly optional. This recipe will make 3 or 4 servings but can be doubled to serve more. Remove lid. Add garlic, Thai curry, salt, pepper, cumin and ginger to the pot. Stir and cook for 2 minutes. Add chicken stock, canned pumpkin (if using), coconut milk and shredded coconut . Cook on medium heat, stirring occasionally, for 35 minutes or until carrots are tender. Puree with an immersion blender or in small batches in a blender. Taste, and season with more salt and pepper, as necessary. Serve, garnished with a dollop of sour cream and fresh cilantro leaves. Very nice with a rustic, crusty bread.